Size: 10.2" x 8.5" x 8.5"
This educational toy for toddlers aged 9 to 24 month trains combination skills. You can insert one of the three shapes into the corresponding tube. Releasing them starts a small melody. 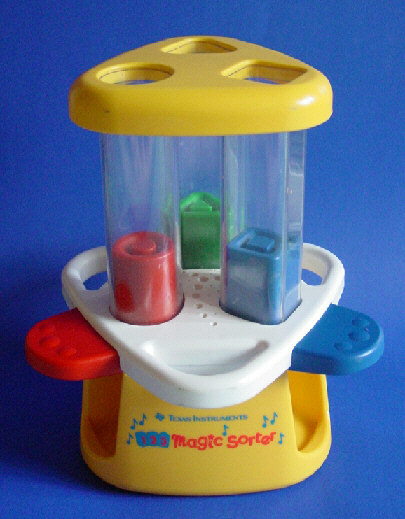 From technical aspects the Magic Sorter is boring. Instead the Speech Technology found in the Peek-A-Boo Zoo or the Listen & Learn a small microcomputer from National Semiconductors controls the three keys and a small speaker. Similar hardware was discovered in the My Little Computer introduced in 1989.